It takes time and practice to learn professional doll repair and you don’t go to the hardware store to buy your restoration supplies. What can be worse than a badly damaged doll? It would have to be a doll repaired by an amateur. Everything you do to a doll should be museum quality work. Understanding the difference between professional doll repair and amateur doll repair can mean the difference of maintaining your doll’s value or turning it into a worthless item to be discarded. What is the difference between professional doll repair and amateur doll repair? Think of it as the difference between a handyman and a professional cabinet maker. It is the quality of the finished product. Anyone can hobble together a box, but it takes a professional to build tight seams, silky smooth wood, and exceptional details. You can apply the same concept to professional doll repair. Anyone can glue together, patch and paint, destroying the value and aesthetic appeal of an antique doll. It takes a professional doll restoration artist to correctly restore a doll: repaint to keep the original artistry; enhance the aesthetic appeal; and retain the monetary value of an antique doll. The sheer number of poor quality doll repairs found on eBay- misaligned edges, adhesive that has stained a doll, or lumps of excess adhesive along the break line – highlight the problems that can be found. Sometimes the damage caused by amateur repairs can be irreversible. 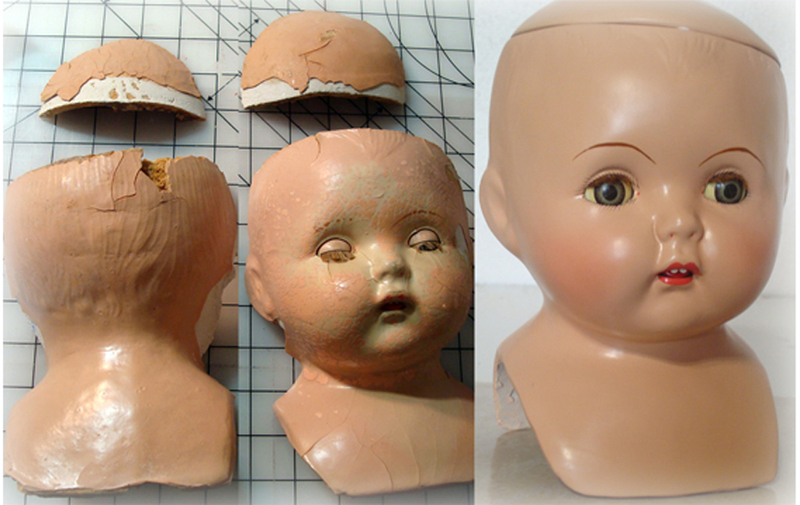 If you value your doll, leave bonding of broken pieces to a professional doll restoration artist. A paint brush should never be used on a doll’s skin or hair. Those areas should only be airbrushed. The only place a paint brush should be used is on the facial details, like eyelashes, eyebrows, and mouth. The detail painting should be true to the original doll, and expertly painted with matching colors. 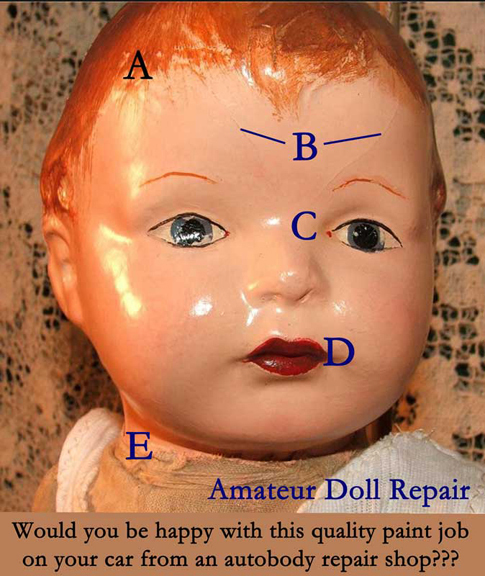 Below is a picture of a poorly repaired doll and explanations for each part. Would you be happy with this poor quality paint job on your car at an auto body repair shop? A – Brush strokes can clearly be seen on the hair and face. These areas should be airbrushed. No brush strokes should ever be seen on a composition doll. B – Cracks can be clearly seen. Paint will not fill a crack whether it is on a wall, on a car, or on a doll. You have to get rid of the crack and make a smooth surface to paint. For a full restoration, the paint is completely removed and repairs are made to the composition before sanding it completely smooth. When the doll is smooth, then primer is sprayed on to prepare the surface for painting. There are several layers of primer and paint with complete sanding in between each layer. C – Eyes and Brows are poorly painted. The irises on this doll may be original, with the rest of the head painted around the eyes. Good before pictures should be taken of a doll, so the repainted doll will be repainted just like the original doll was painted. D – Lips are poorly outlined and completely the wrong color. Paints should be mixed to match the original paint on a doll. E – The head was not removed from the body before doll repairs were started. Notice the paint on the fabric body. How to choose a professional doll restoration artist. How do you choose a good doll restoration artist? It is important to choose a restorer who has years of experience and understands all aspects of restoration. No two doll repairs are alike. Each one presents its own problems. A doll shouldn’t be changed, but kept as close to original as possible, preserving the doll to prevent further deterioration. Your restored doll should represent as close as possible, both visually and physically, its original condition as it left the doll factory. Ask lots of questions and ask for before and after examples of doll restorations. Ask for clear before and after pictures. Ask how long they have been restoring dolls. Ask what their background is in doll restoration. Ask if they are experienced in the kind of repairs your doll needs. 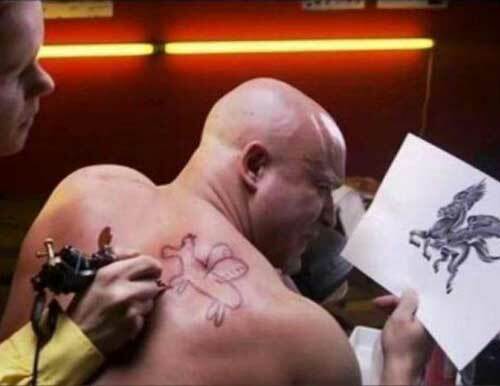 Ask if they use an airbrush or paintbrush for repairs. Ask for references from other customers. Ask for a written estimate of the repairs. Below is a good example of a before and after professional doll restoration. But, there should also be a close-up of the face to make sure the detail painting is true to the original. Quality restorations should be virtually undetectable either on the shelf, or up close. That is the biggest difference between amateur and professional doll repair. There is a wide range of prices for professional doll repairs, but keep in mind that you get what you pay for. Professional doll restoration is not cheap, because more expensive materials are used in the restoration process, and more skilled time is required for museum quality restorations. An average price range is about $12 to $18 per inch of doll. Each doll presents different repairs, so it is hard to give an average price for restoration. A restoration artist will be able to give you an estimate based on pictures, but will need to handle your doll to be able to detail every item that may need fixed on a doll and to give you an accurate bid for restoration.